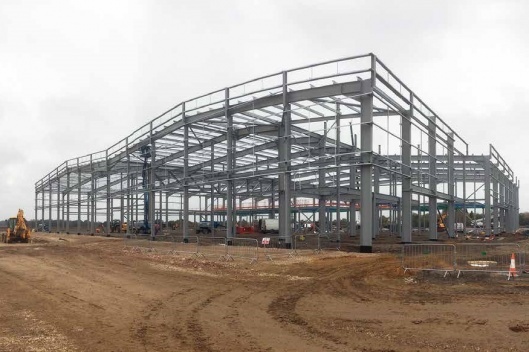 Leading UK food producer Cranswick is constructing a new £60M steel-framed poultry facility in Eye, Suffolk. A greenfield site on a rural airfield in Eye, Suffolk is being converted into a new state-of-the-art poultry facility by food producer Cranswick. The company says the new site, which is due to open later this year, will be one of the most efficient and sustainable poultry processing facilities both in the UK and Europe, supplying leading UK retailers and other manufacturers with fresh produce. The site will employ over 700 people, with approximately 300 new jobs created in the region and the remaining staff transferred from Cranswick’s existing production facility. Cranswick already operates three food processing sites and runs pig and chicken farming operations across Norfolk and Suffolk; employing over 2,000 people in the region. This latest project is the largest single investment it has ever undertaken. In a bid to bring as much benefit to the local community as possible, Cranswick has awarded over £10M of the project costs to local contractors. 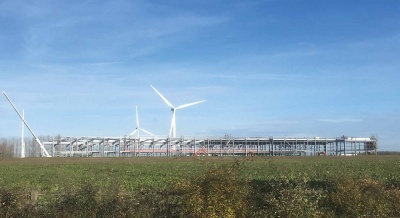 This has seen Kings Lynn-based Trundley Design Services being contracted to undertake both architectural and structural engineering responsibilities for the project, and Norfolk-based A C Bacon Engineering being subcontracted to fabricate, supply and erect the steelwork. Work on site kicked off last year with another local firm completing the groundworks contract. This work included the excavation of more than 80,000t of earth, in order to flatten and prepare the plot. Supporting the steel frame over 10,000t of concrete pad foundations were also installed. The poultry facility consists of one large steel-framed structure which is 219m long and 116m wide at the widest part, with a maximum height to the underside of the eaves of 10m. “The building required the flexibility of a clear span with minimal internal columns. Due to the complexity of the internal equipment layout the steelwork had to be effectively designed around this restriction. Based on this, the only material that could fit the criteria was steel,” adds Mr Trundley. The food production part of the facility accounts for 189m of the overall length, while the rest is occupied by a two-storey office area and an 11m-long entrance pod. The majority of the production area is 78m wide and consists of a twin portal frame with two 39m-wide spans. For approximately one third of the production area’s length there are attached mono-pitch structures on either side that provide extra workspace and bring the structure up to its maximum 116m width. 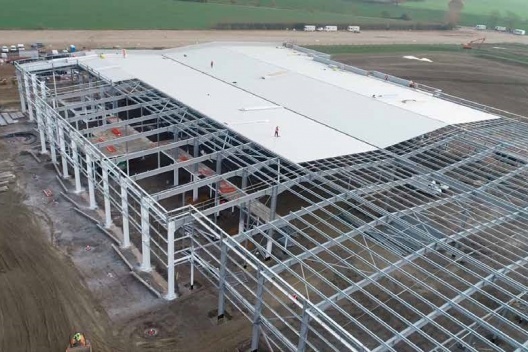 “To form the roof of the structure we delivered most of the rafters to site in 18.5m lengths, spliced them together on the ground to form 39m-long sections and then lifted the complete pieces into place,” explains A C Bacon Engineering Commercial Manager Ryan Bailey. A C Bacon Engineering used two of its own 60t-capacity mobile cranes for the steel erection programme, one positioned in each portal span. They then both worked their way down the entire frame erecting the two sides simultaneously. Adding some more floor space to the production area, there is approximately 6,000m2 of mezzanine flooring within both portals. Based around a 6.7m column grid pattern, the mezzanine levels as well as the two-storey office block, are formed by steel beams supporting precast slabs. Creating more column-free space, two 26m-long × 3.8m-deep trusses have been installed along the structure’s valley line. By installing these two 8t trusses, a total of eight central columns were able to be omitted. The two trusses were the heaviest lifts on the job. For ease of transportation they were brought to site in three pieces, which were then assembled into 26m-long sections and lifted into place.